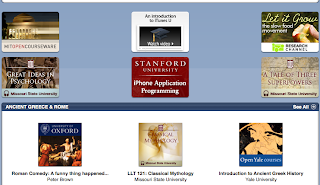 iTunes U, Aaronson’s MIT lectures on theoretical computer science, MIT OpenCourseWare, OpenAccess journals and the BBC’s In Our Time are now freely available to a good portion of the world. Even in poor nations, they are likely accessible in many universities. I beat on Apple and Google all the time, but, really, the iPhone and iTunes U would stun a geek of 1986. We entropics do not appreciate how far we have traveled.